"...extroverted, engaging and stylistically sympathetic performances...a fascinating project, and I look forward to further volumes." "...Amalong's performances are consistently impressive...more than enough wit and dexterity to keep you amused and amazed..."
"Philip Amalong, the Cincinnati-­based pianist who has developed this ongoing project, has said that he likes to play toccatas because he likes the way they feel in his hands and in his ears. It shows. His playing is both technically assured and joyous. This is a very­ well­ produced survey of American piano music, as heard through the filter of a particular form." "5 Stars! What a Devilishly Clever Idea! ...Pianist Philip Amalong has scored a coup...One must say a word not only about the cleverness of Philip Amalong's programming, but his invigorating playing on this disc. I'd not known of him before but am definitely signing up for any further discs he decides to make." 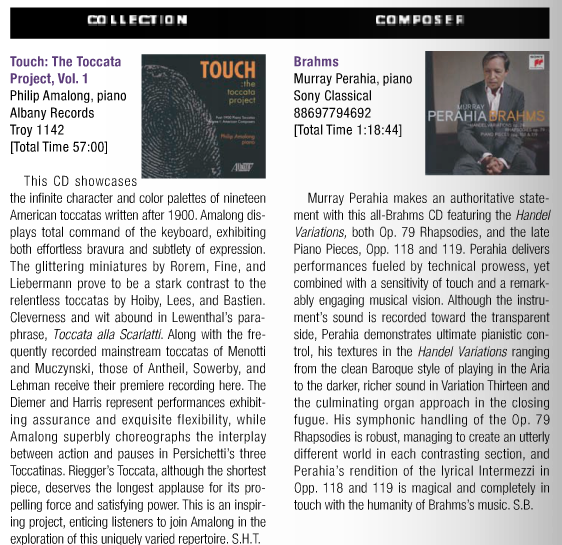 "There is not enough space to discuss every piece, but each one has its particular personality and contributes to the iridescent colorfulness which makes this CD special. The moods may be diverse, but one thing is true for all pieces on the recording: they require considerable pianistic dexterity, and pianist Philip Amalong masters not only the technical challenges with sovereignty, but also offers interpretations of the more complex pieces by Rorem and Harris that are convincing and captivating. This CD will broaden everyone’s mind about the toccata; and considering the struggles the composers had to overcome to create such variety within a genre that is often considered a playground for pure mechanical ostentation, the well known proverb gains a new meaning: Necessity begets ingenuity."